On Sunday, December 17, the 8.6km Toronto York Spadina Subway Extension (TYSSE) officially opened to the public. A joint venture led by IBI Group, LEA and WSP, in consultation with Will Alsop, designed two of the six total stations: Pioneer Village and Finch West. This is the first new extension on Toronto’s subway lines in 15 years, and the first rapid transit project to ever go beyond city limits. Connecting York and Vaughan commuters, the TYSSE anticipates ridership of 1.2 million people per year. The stations are also expected to boost growth north of Toronto and into Vaughan for years to come. This line “will provide unprecedented accessibility for commuters in the suburbs to downtown Toronto at a lower cost,” said Prime Minister Justin Trudeau at the unveiling. Pioneer Village Station Project Architect, Bruce Han, said “it is incredibly rewarding for us to see the stations we’ve been working on vigorously for years, from schematic design to every detail, becoming operable and yet remarkable architecture for the public.” Straddling the Toronto & York Region border, Pioneer Village Station will function as a mobility hub for the area, servicing 20,000 TTC passengers daily, two regional bus terminals, and providing 1,881 parking spaces for commuters. 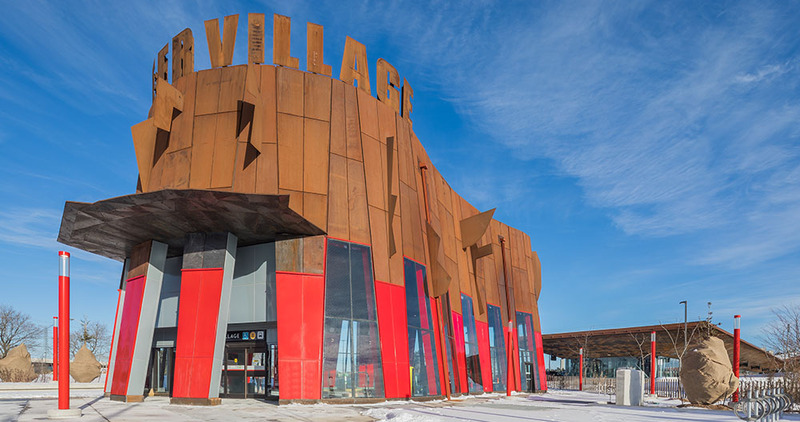 Incorporating green roofs and increased daylight levels to reduce electricity needs, Pioneer Village Station’s dual entrances were designed as a pair of super, sculptural structures inspired by the grand presence of a cathedral. Its location is intended to create a focal point and anchorage in the area to serve the future development, beginning with Steeles Avenue West. 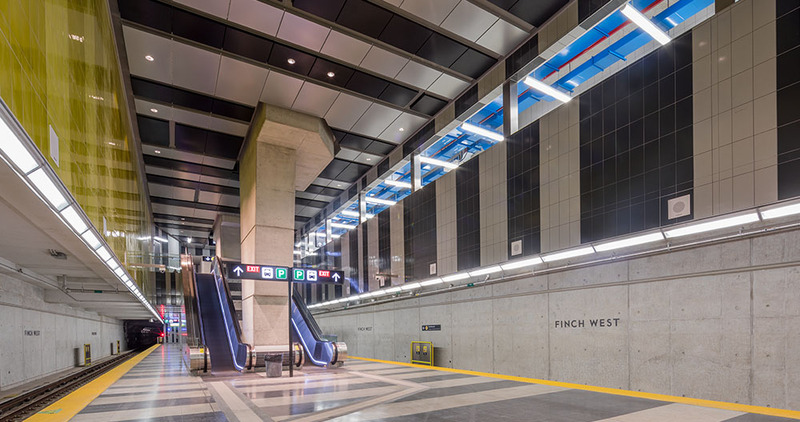 Finch West Station is located at the intersection of Keele Street and Finch Avenue West. The station’s underground platform incorporates a two-storey, full-height “train hall” to enhance a sense of security, comfort and intuitive navigation, as well as to amplify its importance as a vital civic space. The station has two at-grade pedestrian entrances. The east entrance is integrated on to a bus terminal and an elevated “flying” iconic black and white electrical substation. This raised structure allowed for maximum transparency between street and bus platforms, and freed enough space for a generous entrance plaza, retail area and a 100-bike storage facility. The overall result is a station that is highly visible, iconic and a true beacon for the region that addresses and invigorates the street. IBI Group also led the implementation of the public art component at each station. At Pioneer Village, IBI worked to coordinate and facilitate the installation of Lightspell, a hybrid light and art installation designed by Berlin duo realities:united, which enables commuters to share messages on the ceiling LED displays above the platform. At Finch West, artist Bruce McLean incorporated a 6,000-year-old Minorcan design to its underground and at-grade columns. The design team welcomed the concept and integrated it into the architectural and structural design of the station. The result blurs the boundaries between these disciplines yielding a concept that is both functional and exciting. The TYSSE, or Line 1 extention, comprises six new stations: Downsview Park, Finch West, York University, Pioneer Village, Highway 407 and Vaughan Metropolitan Centre. Line 1 is the first rapid transit project to ever break the City of Toronto limits, extending into Vaughan and York Region. The subway will connect to other municipal rapid transit lines, such as Brampton’s Züm, York Region’s vivaNext BRT, and regional GO bus service at the Highway 407 station. This $3.2B project was funded by all three levels of the Canadian government, municipal, provincial and federal.